I’ve got the chance to fish at chew valley for pike and I wondered what rigs would you suggest. Kind regards, Dan. Hi Dan, thanks for the question. My advice is to stick to the rigs that you use and have confidence in with your regular pike fishing. For me that means a standard ledger rig with a three ounce running lead on a run ring or, if the bottom is soft and weedy, a Fox Ledger Stem. 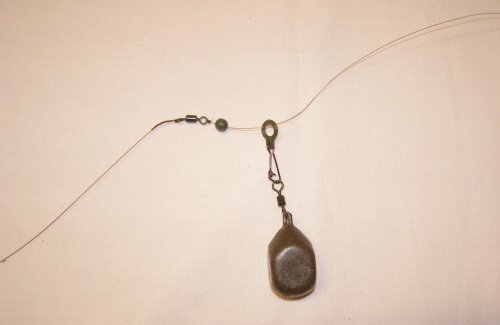 Ledger stems have a buoyant ball that keep the run ring above the weed, allowing line to run freely. Chew Valley Reservoir is shallow in comparison with other massive reservoirs and glacial lakes. I don’t think you have to adjust for boulders and sunken trees but you could, however, hook into pike that are huge. For this reason you should step up the strength of your trace wire. 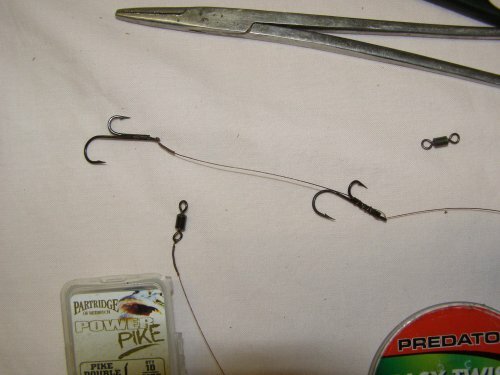 A thirty or forty pound pike is a big heavy lump that will put quite a strain on 20lb wire. I prefer to use two Partridge Double Hooks (sizes 4 and 6) mounted 4 inch apart on 30lb Fox Easy Twist trace wire. Although I do sometimes use trebles, I find the Partridge doubles easier to remove from pike and landing nets. No freshwater baits allowed. Eels, Lamprey and Pollan are freshwater fish and are not permitted. Anyone attempting to use freshwater baits, dead or live, will be banned. All lures/spinners/replicant/jigs must be longer than 4 inches not including any attachments i.e hook, feather, spinner blade. Anglers can only fish with two rods at any one time. Bank anglers must fish rods no more than 1 metre apart and stay within 10 meters of their rods/alarms at all times. All pike, regardless of size must be treated with respect. Strike any runs early. Keep handling to a minimum – don’t spend excessive amounts of time photographing/filming large fish. Knotless mesh landing net, unhooking mat and long nosed forceps are essential items. No fishing within 50 meters of Jetties and within nature reserve areas (full details of these areas are available at the lodge). All trout must be returned unharmed. Any trout that have to be despatched (deep hooked/bleeding) must be declared to fisheries staff. Bank Anglers can commence fishing one hour before sunrise and must cease fishing one hour after sunset. There will be a 30 minutes grace period either side of the start/finish time. Thanks for the question Dan. I wish you the best of luck at Chew Valley.